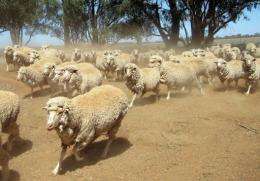 Merino sheep search for feed on a dry and dusty property near Parkes in rural New South Wales in January 2010. A drought that has gripped the southwestern corner of Australia since the 1970s is linked with higher snowfall in East Antarctica, a phenomenon that may be rooted in global warming, scientists reported on Sunday. A drought that has gripped the southwestern corner of Australia since the 1970s is linked with higher snowfall in East Antarctica, a phenomenon that may be rooted in global warming, scientists reported on Sunday. Researchers Tas van Ommen and Vin Morgan of the Australian Antarctic Division said that the drought -- which has seen winter rainfall decline by 15-20 percent -- is extremely unusual when compared with the last 750 years. Hand in hand with the drought is a similarly exceptional rise in snowfall at Law Dome, an icecap on the coast of East Antarctica. The apparent reason is a "precipitation see-saw," the pair report in a paper published online by the journal Nature Geoscience. Relatively cool, dry air flows northwards to southwest Australia, providing little rain, while warm, moist air flows to East Antarctica, where it provides abundant snow. The pattern is consistent with previous studies that suggest a man-made role in the drought, say the pair. Previous research has pointed to greenhouse gases for changing the so-called Southern Annular Model, a key feature of atmospheric circulation in the southern hemisphere. Morons... the drought in Australia has been devastating in some areas. I like to read articles like this one where the kids get on and spout their opinion that basically state "I have not seen any change over my lifetime, so nothing ever will". It is kind of like saying "I am greedy and selfish, and will defend my right to pollute as vehemently as I can!" I'll bet that in 50 years, those same people will be claiming that THEY came up with the whole climate change idea. It just absolutely amazes me how short sighted people are. Basicly, you've got a bunch of people living on a continent that has no long-term human history, and then they want to complain when things aren't going well...who knows, maybe "normal" long term climate is for Australia to be nearly uninhabitable? Ever consider that? Look on the bright side, if AGW is real, then Australians can always move to China, Pakistan, and India. The Himalaya's ought to be habitable once all that pesky ice melts. "I have not seen any change over my lifetime, so nothing ever will". In my home town, the record LOW temperature for two of the past three days was set in the past 20 years, while the record HIGH for all three of the last three days were set 80-100 years ago. This is the opposite of what Global Warming should produce. I believe in catastrophism, and know enough about their odds of happening that I actually expect bad things to happen for various reasons. An 8.0+ earthquake in American soil. Look at the picture! How much of this precipitation shift has been due to livestock, like man introduced sheep, overgrazing the area and eliminating the vegetation in that area? This may be a man made event, like the other man made environmental problems in Australia caused by the introduction of European agriculture over 100 yrs ago. However, based on the evidence and how, we now know, it has been manipulated and cherry picked over the past 15 - 20 yrs, this shift has a low probability of being CO2 related. With enough data you could eventually link a fart in Siberia with a rain storm in Brazil. Some call it the Butterfly Effect. @Quantum_Conundrum, where do you live?, where exactly? "Who is to say this isn't perfectly normal long term pattern in Australia?" Next time you respond to me... at least READ WHAT I POSTED! A few miles south-west of Hammond, Louisiana, in Tangipahoa parish. I was not laughing at the suffering of people. I think it's more likely that deforestation in the Australian region reduced rainfall that instead fell on Eastern Antarctica. Forests reduce ground wind speed and temperatures that invite precipitation. With less forests, the moisture passes overhead without falling to the ground. "I was not laughing at the suffering of people. I was laughing at the absurdity of the AGW contradiction which blames excess snow in Antarctica on global warming..."
OK... it invites karma to laugh at the suffering of others:) However AGW causing increased snowfall in Antarctica is ironic, not absurd. Back in the 70's, when this drought supposedly started, the concern was global cooling. Times have changed and the science has become more retarded. Seriously, when will these morons start doing real science. Not a contradiction at all, warmer air holds more moisture, therefor more snow in colder regions. Strangely enough it is quite possible that long term weather or climate will produce droughts in S.E. Australia. However, geological and biological evidence can provide information about climate going back a lot further in time than any records kept by man. And yes regional changes in climate brought on by man may cause climate change unrelated to Global climate. Such things as clearing, grazing and paving will cause temperatures to rise and rainfall to drop generally. This article does not go into any details as to why the author thinks the changes are caused by global warming from CO2 as opposed to all the other causes of man made climate change. Nevertheless they may have been right even without explanation. My guess is these quote unquote science-ticians have some way of working out what the climate was like before people were around to observe it. AFAIK Gondwana - http://en.wikiped...Gondwana - was a lush green forest climate and so far no books or human records dating from the mid-jurassic area have been discovered. Quantum_Conundrum, it's really not that difficult to understand. In a cold environment like Antarctica a small increase in warming can lead to an increase in evaporation which leads to an increase in precipitation ie more snow. Perhaps you should take a bit more time to educate yourself before making such foolish comments. I think people are just getting 'Climate Change Fatigue' (you heard it here first!) when any surprising, novel or sometimes contradictory weather event is automatically explained away by the dogma of Climate Change, without suitable explanation. I can sort of see why general warming could cause more variance in temperature, leading to more precipitation in some areas, but I think it needs more explaining (in these sorts of articles) than just pointing to climate change as an explanation, and hoping everbody buys it because it's now officially "As Bad As Holocaust Denial" to question it. My personal suspicion is that appending "caused by Climate Change" is an almost cast-iron guarantee to get more funding next year. This post was caused by Global Warming. The El Nino-Southern Oscillation (ENSO) is affecting weather from the Middle East to California. The Arctic Oscillation is affectng weather over the North Atlantic region, and caused the excessive cold and snowfall this winter. I do not find it hard to believe that rainfall in Australia and snowfall in Antarctica can be linked. The problem is to get statistically significant data showing the correlation from a chaotic "haystack"of data, where weather is also affected by multiple other factors. Birger, I think polarising this thing is part of the problem - there's a lot of room between "liberal dupe" and "whackjob conspiracy theorist". Unfortunately we're being told to swallow this pill whole or you're an evil denier. Sure, with enough data that is likely to be true, but, if one tortures the existing data hard enough one could get it to tell you with whom and where the fart originated..... with zero probability of being correct. Sounds familiar. I don't believe your application of Occam's razor is proper. Birger, I think polarising this thing is part of the problem - there's a lot of room between "liberal dupe" and "whackjob conspiracy theorist". Absolutely true. This is why the debate needs to proceed with mutual respect. But there is also a time factor -a good analogy would be the HIV/AIDS debate in South Africa, where AIDS deniers delayed an effective policy so long that 300 000 are estimated to have died unnecessarily. Also a valid comment, but consider... there is no single hierarchy of climate research covering the whole world. Some of the researchers are themselves politically conservative (at least in Europe, where things are less polarised) and they would cry "Murder" if they saw some left-wing attempt to impose a slant on climate research. That's a very poor comparison. Millions die from AIDS on continental Africa due to the religous institution of Corpus Connubi. The "denial" you're referring to was religious dogma, not referenced research. The AIDS epidemic was also proven beyond a shadow of a doubt. We're not looking at a situation that is at all similar here. Grandiose statements and inaccurate comparisons on both sides of the discussion are why things are as muddied as they are. We need to refrain from doing that if we're going to get to the truth of the issue. The main point is that humans are playing a dangerous game with the resources that are available and at some point if we don't get wiped out by a catastrophic event first we are going to have to deal with the results. There are many more scientists who are seriously concerned about GW and want to make sure we are prepared for the worse case scenario than the opposite who contend that everything is peachy and we should continue business as usual. In this case when so many great minds are raising flags it is wiser to play things safe than to continue on the path of excessive consumption and disregard the warning signs. GW proponents don't want to be at the end saying I told you so. It seems AGW proponents relish the thought of rubbing everyone noses in it if they are correct. Personally I would rather play things safe on this matter. And how is that related to the drought in Austrailia? Did their sheep and kangaroo rearing ways remove precipitation from the region? You're making comparision and connections that are not valid. Being a Malthusian you might want to make sure your alarm isn't at a naturally varying event.